Love is in the air, with Valentines day so close by. Don't let all the glitz and glam of the day take it all away from some of the sweetest moments. One of those special moments come in the form of a promise. 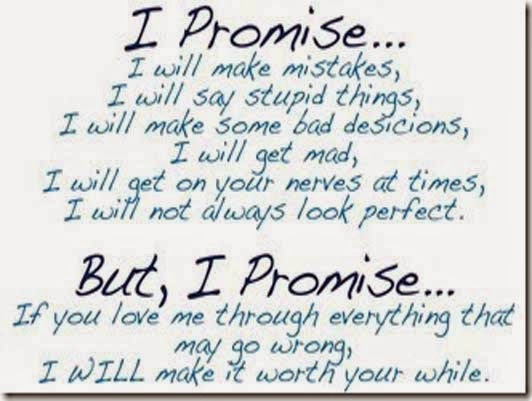 When we make a promise to the one we love it can be the best Valentine Day gift. All though promises may vary and are not all the same the most important fact is that it belongs to you and you are giving it away. Promises may range from the desire of sharing one life together to taking new adventures together or may even include making changes that are endangering relationships. The simple promise of a regular date night may be what you plant to do to celebrate yours and your partners love. 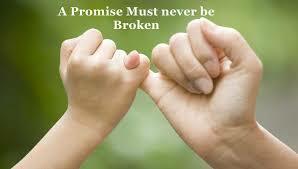 No matter what your promise may be keep in mind that promises are not meant to be broken and must be stuck to once made. I promise to hold your hand through sickness and health, through good and bad, through highs and lows.